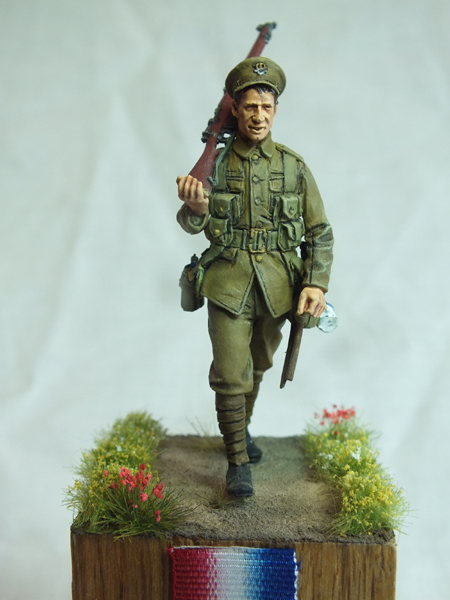 Its fitting that the first figure in the Tommy’s War range is from the 4th Middlesex (the “Die Hards”) as it was this regiment that suffered the first British land casualty as a result of enemy action when Private John Parr was killed while on reconnaissance just north of the Mons-Conde Canal on August 21st 1914. On the 23rd August the Middlesex were positioned on the right flank of II Corps and were one of he first British units to meet the German advance. During the course of the morning the regiment was heavily engaged before withdrawing in the early afternoon, but not before losing 15 officers and 353 other ranks either killed, wounded or missing in action. This figure depicts a soldier of the Middlesex as they would have appeared marching toward Mons prior to battle.